ENG: Most of the successful people claim that a helping hand of the infinite cosmos is the reason for their success. The fact that it helped Risto Bimbiloski and later Christopher Kane, in creation of the Resort s/s 2011 collection leaves little room for doubt. 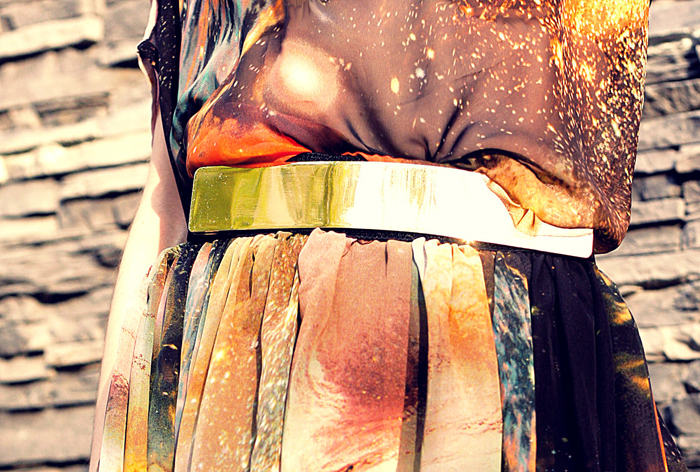 The prints made from pictures taken by Hubble telescope cemented the concept of infinity and the Universe in world fashion. One hardly needs to say that even a year down the line, the cosmos is very hard to forget. RU: Большинство успешных людей утверждают, что их успеху сопутствует космос. В том, что он также посопутствовал Ристо Бимбилоски, а позже и Кристоферу Кейну в создании коллекции Resort s/s 2011, сомневаться не приходится. Снятые в космосе через телескоп Хаббл принты увековечили концепции вселенной и вечностости в мировой моде. Стоит ли говорить о том, что даже спустя год этот космос невозможно забыть. Bag and arm piece are just fantastic!! WOW!!! LOVE that dress. You have impeccable style. BTW... Thank you for the sweet comment on my blog. Hope you will stop by again soon. And far to be too wild-type this dress (spontaneously) evokes me an as subtle as understated way to flirt with stratospheric-like Heights of stylishness I Must add Dear ! I love this!! You look gorgeous and now I know why the prints are so amazing and unique.. because they are real!!! Wow ! Your dress is fabulous and this pics are so beautiful. Love your "dress" it's amazing!! Oh my you are so beautiful with a great sense of style. Love your dress. thanks for your nice comment! I really like your style. You look amazing. You are so pretty and your style is great! Love, love, love this outfit! Great print! Thnx for your comment! I'd love us to follow each other on gfc, bloglovin and facebook. I already started following you on gfc! Let me know when you follow me on the other so I can follow you right back! Have a nice day! Thanks for your lovely comment.i love your outfit.i'm your new follower,hope you can follow me. Wow I love your dress!!! You look gorgeous!! Amazing dress! Beautiful "bracelet ring"
мне кажется наряд тяжелым! а вы такая хрупкая! .....этот наряд подчеркивает вашу женственность! Thanks so much for your visit, your comment on my last post and to be my newest follwer!! I follow you too! New outfit post on my fashion blog: I'm waiting for u! Thank you a lot for your sweet comment! I love Christoper Kane... you look really amazing. Thank you for stopping by and commenting on my blog, thought I'd return the favor! Love that look! The skirt, top, shoes, belt, everything...you put it together well and it looks perfect! Following you now and would love it if you'd follow me back too! Thnks for ur sweet comment in my blog! the dress is amazing, and you look so great!!! Lovely dress!I love your sun glasses! I love if it is proper to say this cosmos prints , very different. Thank you on sweet comment :) Kiss !!!!!!!! galaxy print is always awesome! thank you for visiting and dropped a comment on my blog, really mean a lot! amazing look dear!would you like to follow each other? I'll be very glad! Lovely! I saw a print like this once and bought it for a trip to a crater in Arizona. I'm a new follower. Follow back? wow i love this look stunnning and wow i love ur bag wow...i need to start saving up..
You've got a lovely blog and the pictures and outfits are just my type! Are u a model? you are so beautiful :) I love the t-shirt and the skirt!